At least not when the temperatures are as warm as they’ve been this summer, and there’s a lot of harvesting to be done. I’m rather over getting up at 5.30 every morning to walk Della dog, and then start the picking. Breakfast has become a hasty meal for the duration, fitted in somewhere along the line before it gets too hot. We had an abundance of boysenberries this year – which is excellent as I love them but they are a pain to pick. Literally. The raspberries are chugging along quite steadily and will continue to do so for at least another four months due to the different varieties we have growing, one of which is an autumn produce. All very yummy and delicious but picking them is also a pain so for these two berry varieties long sleeves are essential and in the weather we’ve been enjoying this is not comfortable. Hence starting as early as possible. Despite removing some of the thornless blackberry vines last year we still have one, and of course there are plenty of berries on it which are just ripening nicely. At least I can strip off to short-sleeves when picking them. And the plums have started as well so it’s all on to beat the birds although we did cover the greengage tree after the parrots decided to breakfast on these plums a few days ago. 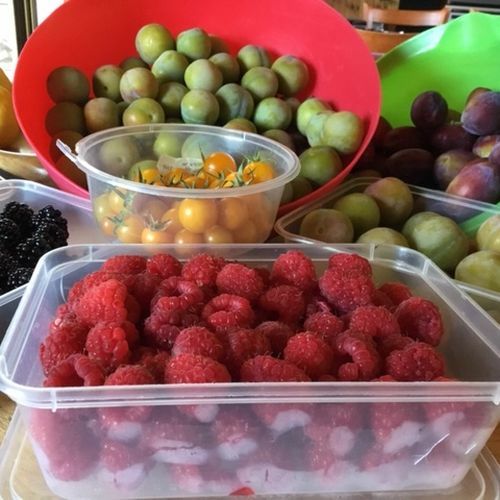 This is the first year we’ve had fruit, and they are prolific – as are the plums that pollinate the greengage – the Prune D’Argan which according to the book we have is the oldest known plum tree in the world. Last but not least are the tomatoes, which are a bit late getting underway but have now started, and there are loads, so the kitchen bench is currently full of bowls of assorted produce that I shall have to work up enthusiasm to do something with. So where is John in all of this? Well, he’s not been slouching around. All the watering is down to him – which includes all those native trees and bushes he’s been nurturing so carefully, which he’s grown from seed or cuttings, as well as the rest of the garden. For some it’s a hand watering job with buckets of water. So as I swelter over picking produce I keep reminding myself I will appreciate all this bounty in the winter months when I go to the freezer(s) and from the selection that’s there, pick out a container of some of this home-grown produce to make those winter-warming casseroles and crumbles.